While cleaning up my room with a broomstick, I use the dustpan to collect dust and garbage, but those last lines of dust don't go into the dustpan. That's why I have to leave it there. Just keep sweeping the remaining line into the dustpan. It'll shrink more and more each time you sweep it, until in the end there's nothing left of it. It also helps to change the angle of sweeping each time; that way, what was a long line becomes a shorter line relative to the new angle of direction. Just blow it back around the floor and pretend it never happened. If a rug is available, traditionally you would sweep it under the rug. 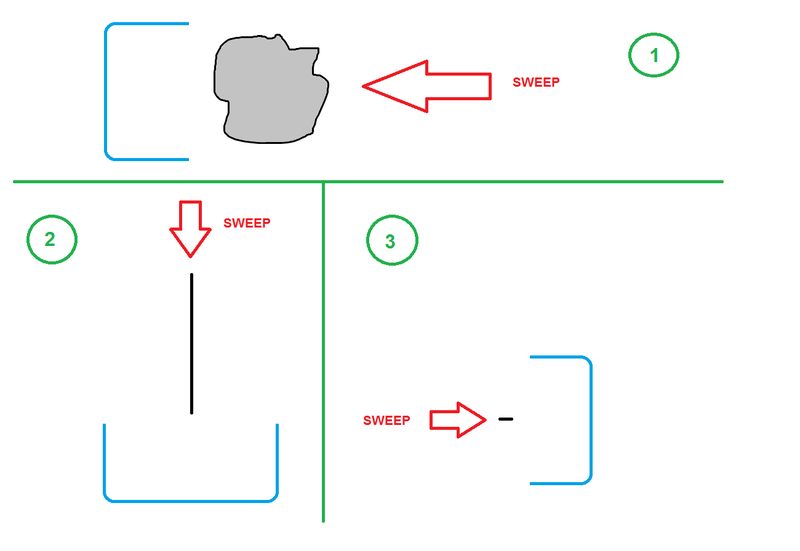 Explanation: if it's not enough dust to sweep up it's not enough to care about. I don't have any citations for this. It's a technique I came up with myself and I haven't documented it anywhere else. Maybe someone else has covered it, I can update if needed. This is a widely known lifehack. 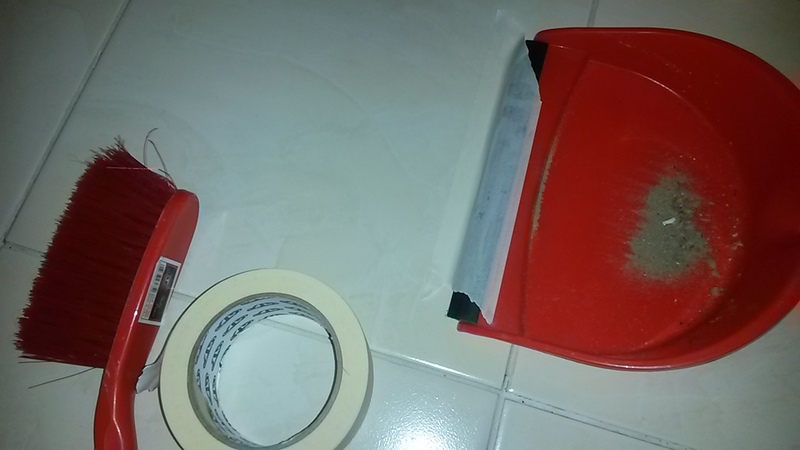 Use masking tape - just tape the front of the dustpan to the floor. It should cover the gap between the floor and your dustpan. I use a hand held vac on the small particles of dust that won't sweep up. My mother always dampened a paper towel and wiped up the dust that way. Either is logical and works perfectly. move the dustpan backwards when sweeping the last few bits into it. I've done this for years and it helps greatly. 2-3 of those usually gets it all. Modern dustpans have evolved a compliant rubber lip that already assists with this task. Using a feathered bristle brush with light downward pressure also moves the dust sideways over the lip instead of down and under the lip. The bristle type I mean is illustrated in this car washing brush but common these days on those sold with dustpans as well. As a computer guy, I realized that the remaining dust is an exponential problem. This realization would have been bad for a mathematician: It means that true cleanliness can only ever be approached, never reached. Alas, I am an engineer, and for me exponential decay is very good news. It means that I can get the amount down a lot with just a little persistence; and where a mathematician only has an infinite featureless floor, I have djechlin's carpet which will take care of the rounding errors. The underlying observation was that even versus the end of the "shoveling-into-the-dust-pan-process", each sweep does move a certain fraction of the dust into the dust pan, which is of course the reason for exponential reduction. sweeping in a more "upward" movement, rolling the hand brush around its handle axis. In this fashion I sweep half a dozen or a dozen times in quick succession, each time moving the pan back a little, each time catching another fraction of the remaining dust. The operation only takes a few seconds and needs maybe one or two feet of space. Because my floor is not featureless I can take advantage of seams and gaps where they are available. 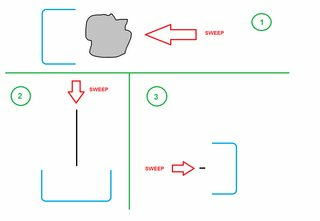 On the math side of engineering we can estimate the remaining amount of dust after n sweeps: Even if each sweep only removes 20% of the dust, i.e. 80% of the dust remain, then each three sweeps halve the remaining dust; 12 sweeps reduce it exponentially to 0.8^12 = 0.06, or 6%. That is often good enough to move on to djechlin's strategy ;-). As an added bonus, if you're ever attacked by burglars or isis or whatever while you're sweeping the floor, you can take out their carotid artery with your sharpened dustpan. As an added added bonus (bonus x2), you'll be able to sweep up the entirety of your attacker's mess without leaving behind those annoying last few lines. A sheet of paper can serve as a makeshift dustpan. Hold it in the middle on one of the long sides, giving it a slight crease with your thumb. When applied with gentle pressure, and at a rather steep angle, the leading edge should hold true to the floor. No other technique using a broom can get more dust into the 'pan' and less into the air. Not the answer you're looking for? Browse other questions tagged cleaning dust or ask your own question. How to clean a dusty television screen? How to remove dust particles when it accidentally goes into our eyes? How to remove dust from fridge coils? How do I keep dust away when applying a laptop screen protector? How to get rid of bug stuck into eyes? How do I avoid or otherwise minimize the mess of dust from scratching a game currency card?